Home | Soul / Astrology | Announcements | The transformational New Moon Eclipse on October 23rd. October 23rd is a very special day. There’s some amazing energy emanating from a very friendly solar Eclipse going around. The Sun and the moon will receive the blessing of Venus, the goddess of beauty, love, luck and all the beautiful things life can provide. This stunning meet up will benefit all of us and will be like a propeller for further developments. Observe what comes to your life today, and remember there are no coincidences in the universe. If you meet someone today, if you discuss a business project, or have a brilliant idea, go ahead and invest in it. This is the perfect Eclipse to make a wish board and place the wishes you want on it to help make them materialize. You have no idea, how powerful this eclipse will be for helping you to make a dream come true; your desire along with faith and an open mind will be important for you to receive these blessings. Please buy a cardboard and write, design or place the pictures that would represent what you want to materialize in your life, be it a loving relationship, a career accomplishment, your health, or anything you want to ask for. Particularly for Capricorns and the ones who have 0º Scorpio in their 11th house, which is the sector of one’s dreams. Next week, when you wake up Monday morning you will be surprised by how things will go a lot smoother than they have in the last 20 days, as you arrive at the office or your work place. Everything will finally move forward, because Mercury is direct again..
We will see a lot of progress next week. It’s time to roll up your sleeves my dear and get the job done and go on with all your ideas, projects and meet ups. To connect more intensely with this energy of the solar Eclipse, meditate today, reflect upon your life, your decisions, and behaviors and change what needs to be changed. Don’t procrastinate any longer because your life is waiting for you! This is the time to act smartly and take advantage of this fantabulous energy. 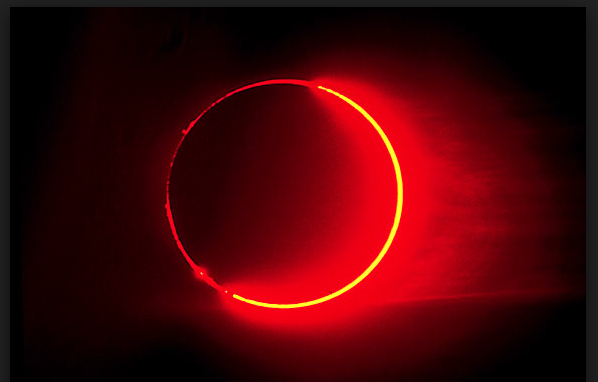 For a better and more precise understanding of this friendly New Moon Eclipse, please see on your chart where Scorpio 0º degree fall and read it according to the correspondent house. This is your time to shine and get all the attention to yourself. This Eclipse will represent a rebirth for you. You will reprogram yourself, set your priorities, and recreate yourself under a new light, one that will promote a big evolution for you, in career, love and on a personal level. This Eclipse can bring a wave of luck for you in money matters, you may get a raise, or a new job where you could double your salary, or a project you had launched before can become a great success. Money will spread, it could be in either a small or large portion. This Eclipse of the 23rd, will be super beneficial for you. You may hear good news about a contract or if you work with the media you could have a great proposition for a TV show or something similar. You may have lots of fun if you are traveling around during the days of the Eclipse. This Eclipse will bring good lucky and a lovely energy for relationships with siblings. You won’t believe in the great opportunities that will come your way at this time. Your family can be the source of much joy and also a source of help and support. You may find the house of your dreams, and if you are looking for purchasing or selling a property, the next two weeks will be very auspicious for that. This is going to be the most friendly Eclipse of the year for you. If you are thinking about children, you’ll be surprised by some unexpected news. If you have children this is going to be a fun time you’ll want to spend with them. Single Cancer, please circulate, attend all the parties, engage yourself in a matchmaking web site, because during this Eclipse you could start a beautiful love story. If you have a project to start, use this new moon Eclipse to do so. I know Mercury is still retrograde, but 7 days after an Eclipse you can still take advantage of it’s positive energy. The friendly Eclipse and new moon in this area of health can take care of health conditions that are worrying you, suddenly you may find out you are healed or a previous treatment presented a result above your expectations. You may me surprised with an avalanche of successful projects in your work place. Your daily life will not be the same after this Eclipse. Something very good will be taking place, either you go to a new job, because you will receive an offer you can’t refuse, or you present a project that will be a success which will surprise everybody, or you start a successful diet that will improve your health in a way you never imagined. This solar Eclipse new moon strikes the area of relationships, changing the scenario unexpectedly but to a MUCH, MUCH better place. This will be the last axis of Taurus/ Scorpio Eclipses and you are free and done with those challenges in relationships. You end this phase with a golden key, having this friendly eclipse in your area of relationships, you could start to make plans with someone for the future, or prepare for an engagement, plan the wedding or take the first step to make a serious commitment. You may form a partnership that will be very significant for your career. A special client could bring in a large profit on a business deal or you clientele may grow. As you have noticed, your life has been undergoing a tremendous change since November 2013, and now you are ready to start a new chapter in your life, a beautiful new chapter. This Eclipse in your area of money will be super friendly and you will find a solution for any financial problems that arise. Money can come from a source you were not expecting. If you are waiting for a tax return, feedback on a scholarship or financial aid application, a line of credit to purchase something like a car or a house, it’s coming. Just trust the universe and be positive, sometimes when we become very negative, we push away our possibilities and good luck. It could be a super passionate day, your power of attraction will be enhanced! Love is in air, as is sexual pleasure. Now you can feel the beauty of the universe coming your way. This friendly eclipse will be a blessing to your area of international matters, other countries and the higher mind. You may hear about an amazing opportunity to move to another country or to do business with an international company who will hire you based on your expertise. If you are in school you may present a thesis that will impress your professor, or someone who is a recruiter may offer you a great opportunity. This Eclipse can change your spiritual beliefs, it can show you a new path where you will connect yourself with the universe in a different way and will expand your view about life and why you are here. This beautiful and friendly Eclipse in your area of career will represent a moment of new beginning, a moment of success, progress and new developments. You may start a new project during the week of the eclipse, a new job or a new career direction; whatever you start will develop under a truly amazing energy of progress and fast growth. It’s such a blessing to have an Eclipse like that in your career sector, and this is the last one of a series of Taurus and Scorpio eclipses that started back November 2013. If your job or career is at a stand still, this is an excellent time to think about something new, to innovate, to create a new project or to follow your dreams. Don’t hesitated to take a new direction you won’t regret it. You have no idea how powerful this eclipse will be for helping you to make a dream come true; your desire along with faith and an open mind will be important for you to receive these blessings. A close friend can be very supportive in helping you in many ways. Like an important or influential friend can open a door for you of opportunities or make an introduction to someone or a client who can present a great improvement in your life. This friendly eclipse will be touching your area of the subconscious mind, hidden subjects, and spirituality because it deals with past life experiences and all the things that don’t belong to the material world. This eclipse could awaken a gift of healing you didn’t know you had. It’s a good time to meditate, to be in solitude, to get in touch with your soul and reflecting upon your journey in this life time.